Rovio is preparing to bring the cast of its hit bird-flinging simulation into a weekly animated show, because apparently dominating just one kind of media isn't enough. Sometimes it pays to wonder whether the gamers of the future will look back at Angry Birds as a passing craze, or as the beginning of the mighty Rovio dynasty: a benevolent, absolute monarchy that demands a yearly tribute of avians to be hurled into nearby walls. After topping 700 million downloads, Angry Birds is easily one of the most successful videogame franchises of all time, and a number of toys, commercials, and fruit snacks have cemented its utility as a printing press for money. Now, to sate hungry fans until the feature film arrives, Rovio will release a weekly animated series on a plethora of platforms, set to debut later this year. "It's a great way for us to connect with our existing fans, to give them more and keep them engaged," says Nick Dorra, head of animation at Rovio. "But it's also important for acquiring new fans because not everyone might want to play the game or is not able to play the game." The Finnish studio currently has 52 short episodes planned, and intends to broadcast them on "all possible platforms." This will most likely include the usual suspects of app stores and video services, but with such a catholic goal, regular old broadcast television is not out of the question. Dorra also hopes that expanding Angry Birds into a transmedia franchise will help flesh out some of the story and personalities behind the birds and pigs themselves. "[Angry Birds] will, in the future, be less and less about the slingshot and more about the characters and their adventures and all different kinds of games in different forms." It won't hurt, of course, that the games' cast of characters happens to be very, very marketable. 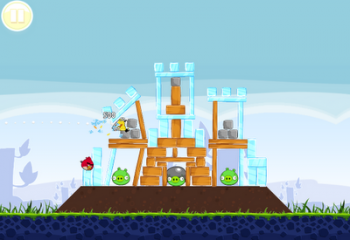 Love it or hate it, Angry Birds looks like it's going to get bigger before it subsides. With a brand new game just released, all sorts of new media on the way, and its very own theme park in the works, perhaps the antagonistic pigs in the next game will sit atop large piles of cash instead of wooden beams.